Customers can order a telephone call to the consultant in 25 seconds. and wait for notification of a new conversation (available in Chrome, Firefox, Opera). We may invite a client to chat or display any message if he or she intends to leave the site..
We invite you to test and share your experiences with us. A refreshed modern skin of the chat window, which could easily be adjusted to the individual theme of your website. 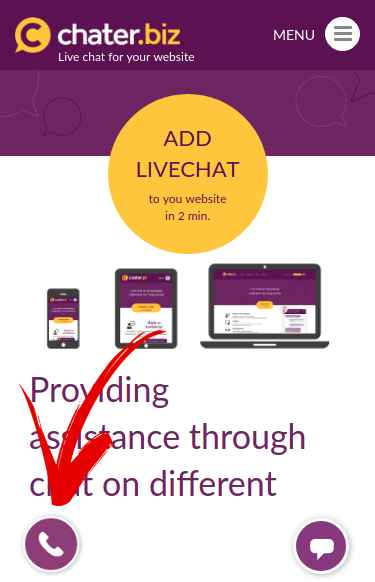 Its activation makes the chat window always ready for a conversation (irrespective of whether a consultant is available within a given moment). Opening the sections in accordance with the settings indicated in the administrator panel. Possibility of indicating which section should be automatically opened after the client enters a specific website. Possibility of indicating several websites where triggers will be performed simultaneously and choosing when the trigger is to be performed: a trigger for a new visit, returning client, or with each visit. Possibility of adding graphics for the message. Chater.bizl application for Linux, with which the use of the chat will not require using the browser. We encourage you to test the above mentioned functionalities and share your comments. 2016-12-12 07:23:44We are pleased to inform you about new features that appeared on the site. Affiliate program Feel free to use and send us comments.